Have you ever noticed a smell in your kitchen, symptoms and just not been able to locate the source? Check your kitchen sink! 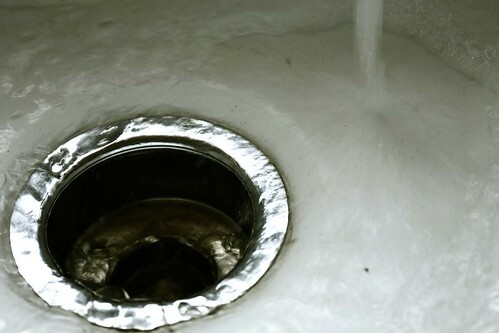 Cleaning a garbage disposal or drain is very simple, and a great way to keep your drain clean and smelling fresh. There are multiple ways to use ingredients you might have at home already. It is a good idea to keep the ice in your freezer fresh by emptying out the ice cube holder. When you dump the ice into the sink, use a wooden spoon to push it into the disposal, add a cup or two of vinegar and turn on the garbage disposal. As it runs, add some water to make a “vinegar slushy”. As the ice breaks up, it grabs food particles and cleans the unit while the vinegar kills bacteria. #2 Oranges, Lemons and Limes, Oh My! If you have some fruit that is getting a little soft, instead of throwing it away use it to clean. You can squeeze citrus fruits such as lemon, lime, or oranges to make the drain smell better. Many name brand cleaners have citrus in them to make them smell better and more attractive to customers. Orange peels work great for polishing a stainless steel sink. The peels are abrasive but gentle and polish the metal, leaving it smelling great. As you might remember from when you were a kid, baking soda and vinegar make a great volcano! Pour a liberal amount of baking soda down the drain and add vinegar until the volcano erupts back into your sink. The reaction of the two ingredients can clean out the drain and leave it smelling better. If you have a septic system where you live, a dish disposal is not recommended. Adding excess waste from a garbage disposal is harder on any drain system and can add extra cost in maintenance with a septic system. You are here: Home » Basic Home Maintenance » "